I found this great idea from V and Co. to make a cute bracelet from strips of knit fabric. What a perfect way to use up my ever growing pile of jersey fabric scraps! V and Co. gives plenty of instructions, even a finger knitting video if you’ve never done it before or if you need a refresher. I made my bracelet with the two finger method. My first bracelet was too big (I forgot the key component of this fabric – it stretches!) so I made a second, smaller bracelet. Vanessa suggests you tie together three 1″ by 58″ strips but I managed to only use one strip for my smaller bracelet and about 1 and 1/4th strips for the first, bigger bracelet. 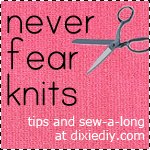 Keep in mind, if you do a three or four finger weave you will obviously use more fabric. Cute and summery – and so easy to make, too! Previous Article← Do I Really Need to Take a Sewing Class?